Sapheon has announced the Health Canada approval for its VenaSeal sapheon closure system, designed to treat venous reflux disease (varicose veins). VenaSeal features a specially formulated medical adhesive that closes the saphenous vein. It eliminates the need for surgery, thermal ablation, sedatives, and tumescent anesthesia. Sapheon has also announced that the first VenaSeal cases in Canada were performed by Dr Joel Gagnon and Dr David Liu in Vancouver and Dr David Szalay and Dr Ted Rapanos in Toronto. A total of nine patients have been successfully treated with 100% vein closure without using tumescent anesthesia or post treatment compressions stockings. Sapheon Canada sales manager Nate Raabe noted the company is fortunate to receive early support from leading Canadian physicians in vein care. "We have seen excellent clinical results in patients throughout Europe and look forward to expanding VenaSeal’s availability in Canada," Raabe added. 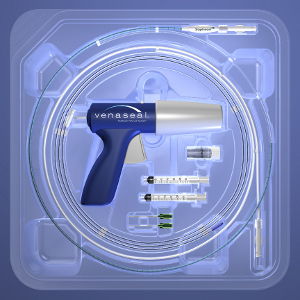 Currently, the VenaSeal system is under clinical investigation in the US in the VeClose randomized pivotal study. The VeClose study has been designed to assess the safety and effectiveness of VeClose system compared to radiofrequency thermal ablation. The VeClose study was authorized under an FDA-approved investigational device exemption (IDE). It has clinical investigators at 10 sites in the US for the treatment of 242 study patients. The study was fully enrolled in September 2013. Since receiving CE Mark approval in September 2011, the VenaSeal sapheon closure system has been used to treat over 1,700 veins in patients in Europe and Hong Kong without tumescent anesthesia or post-procedure compression hose therapy. The VenaSeal sapheon closure system is an investigational device in the US and is not commercially available in the country. Image: Sapheon’s VenaSeal system for treatment of venous reflux disease. Photo: Courtesy of Businesswire/Sapheon Inc.